Memory is a strange thing. I remember being entranced by this film when my parents took me to see it at the Odeon in Bristol, when it came out in 1968 - I was nine. It was projected in a super-wide format and I remember the screen was so wide I couldn't see it all at the same time. I watched the film again last night and wondered why I have wasted brain cell capacity to carry memories of it for 50 years! It was dire. Have you ever watched a film and been similarly disappointed? 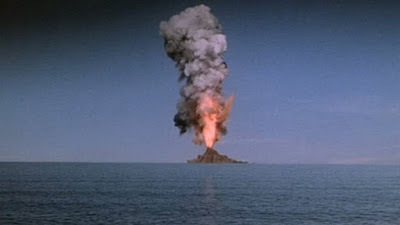 The most famous thing about this film is the fact that the volcanic island of Krakatoa is actually West of Java. The film was shot entirely in Italy and Spain - perhaps if they'd actually visited the Dutch East Indies, their geography might have been less confused. Whether that would have translated into a script and story that contained any excitement, or moved at a pace that was quicker than pedestrian (zimmer frame assisted), is doubtful. The ensemble cast was for its day a good one. The exotic location and the idea of hunting for sunken treasure, a mutiny and a volcano about to blow its top, all combined to hold out the prospect of an entertaining watch. With special effects straight out of Thunderbirds and drastically overdone, this film manages to disappoint in just about every way. I prefer the film of my memories. I note that Rotten Tomatoes manages to award it 0% whilst a more generous IMDb 5.5/10! Its main problem is that it tries to deliver a fairly standard story but borrows so many cliched scenes from other adventure and disaster movies that it ends up being a bit of a dog's breakfast. As an impressionable nine-year-old I was obviously impacted by the cinematography and projection format. It probably also reinforced my hunger to travel and see the world, so perhaps it has one or two redeeming qualities. At a struggle, I'll award it 4/10. Only watch as a cure for insomnia.